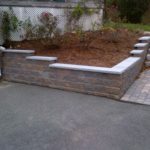 A seating wall is a simple addition that adds major value and function to your outdoor space. 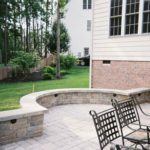 A seating wall not only provides extra seating space but helps to define areas of your outdoor living area. 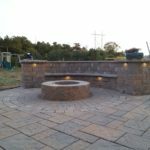 A seating wall is a great option for around a fire pit or think about adding columns to the ends of your walls with additional lighting or plantings. 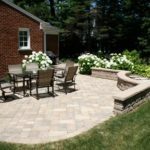 If you need some lower level retaining walls round your patio, you can build your seating wall in front of the retaining wall, creating a seat with a back to it and creating a retaining wall that you can actually use. 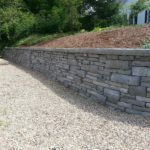 Over the years we have found that the best height for a seating wall is around 20” tall. This may vary based upon your needs and design, but this something we have found is ideal for most of our clients. Also, the depth of the seating area should be no less than 12”. We have found that a depth of closer to 14” is even better when it comes to comfort and design. 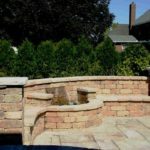 Using a smoother cap stone goes a long way in creating a more comfortable and functional seating wall. 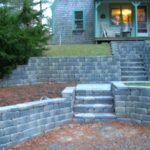 Do I need a building permit for creation of my seating wall? 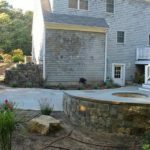 In Massachusetts, a building permit is not required for walls under 4’ in height. 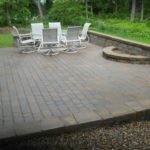 If your seating wall is on a raised patio, a permit may be required based on the finished height. Also, a railing may be required if the patio and wall are high enough. 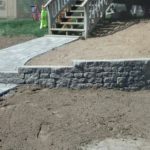 Will you design as well as install my seating wall? 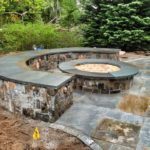 Contact Sheridan Landscaping for a free estimate on our seating wall designs and installations at (774) 413-5012 or fill our contact form to get immediate assistance.